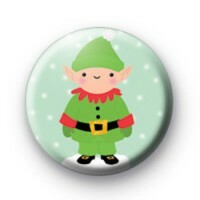 Christmas Elf Badge 25mm pin badge in light green with festive snowflakes and a super cute green elf illustration with a red trimmed collar and black and gold Santa Claus belt. These are perfect for all of your Santas little helpers and elves around the house at Christmas and can be pinned to your Christmas stockings and Xmas tags to celebrate father Christmas visiting. We have a great selection of Xmas badges available in the Christmas badge section and these badges are really popular each December. Be sure to stock up in time for Christmas and use our badges to decorate your school uniforms, work clothes or Christmas stockings. 25mm badge made in the UK.